If you've never butterflied a whole chicken before, now's the time to try it. You don't even need a knife - just a study pair of kitchen shears. It's worth the slight effort to remove the backbone and flatten the chicken out, which results in much more even cooking of the light and dark meats, providing a roast chicken with truly juicy white meat and tender dark meat. 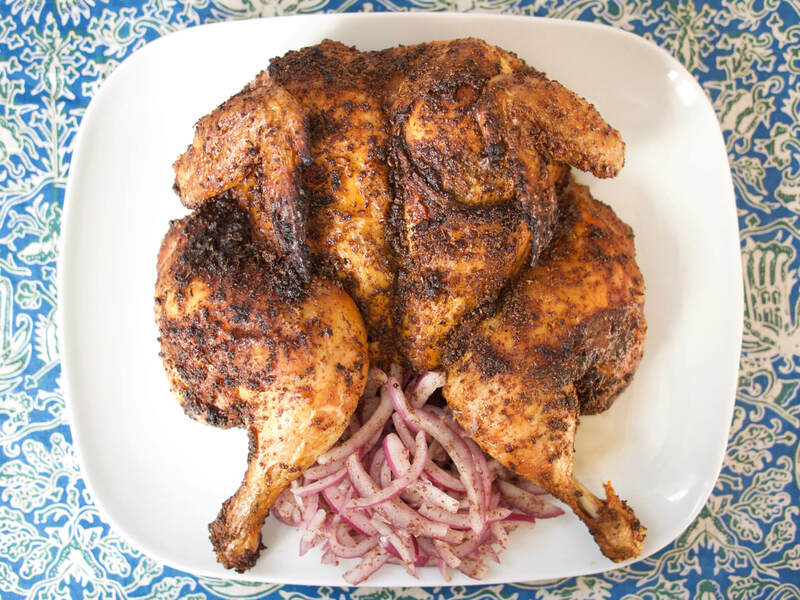 The spice blend rubbed all over the chicken steps the flavor up a notch further, a perfect blend of complex earthiness and spice, which will have you coming back for more. Sumac onions brighten the dish, cutting through the richness of the roast chicken with a simple marinade. This recipe makes a great centerpiece for a dinner party or as part of your meal prep for the week ahead, providing a flavorful protein to go in salads or to be reheated as part of a hot meal. Heat the oven to 500°F. If your oven only goes to 450°F, that works too! Line a rimmed baking sheet with tin foil and set a wire rack inside of a rimmed baking sheet. If you don’t have a wire rack that fits inside a baking sheet, you can simply place the chicken on the foil-lined sheet. Spatchcock, or butterfly, the chicken. This is much less complicated than it sounds! Remove the bag that may be inside the cavity of the chicken containing the giblets and reserve for stock or other uses or discard. Place the chicken breast side down on a cutting board and snip along either side of the spine with a pair of sturdy kitchen shears, removing the spine entirely. Reserve spine for stock or discard. Flip the chicken over so that it’s breast side up and spread its legs apart, so that the drumstick ends are pointing down. Press down on the chicken’s breastbone, firmly, until you hear a crack and the chicken lies flat. Tuck the wing tips behind the breasts to prevent burning. And now you have a spatchcocked chicken! Here’s a more visual explanation of the process, if needed. Drizzle the olive oil over the surface of the chicken and then sprinkle the harissa, celery seed, kosher salt, and Aleppo-style chili over the top. Use your hands to rub the oil and spices into the chicken, making sure to work them into each fold and crevice. Place the chicken on the wire rack, breast side up. Roast in the oven until the thickest or coolest part of the breast registers 150°F and the legs are at least 175°F. This will take at least 40 minutes, but check the chicken after 20 minutes to make sure that parts aren’t burning -- if they are, you can reduce the temperature by 50°F or create shields with pieces of foil. While chicken roasts, make the onions. Toss the sliced onions with the sumac, salt, and vinegar in a bowl and massage gently with your hands. Allow to marinate while chicken finishes roasting. When chicken registers correct temperatures on the thermometer, remove from oven and allow to rest at room temperature. Carve and serve with sumac onions. A hearty fall salad spiced up with Vanns Harissa and Aleppo Style Chili Flakes, with a touch of savory depth from miso and soy sauce. Have you ever heard of sumac? If you live in the American South, you may think of it as a weed. But hopefully after making this recipe, you will now think of it as a delicious weed. A fairly simple set of ingredients combines with a blend of Vanns spices to create a complex and hearty dish that your guests might not even realize is vegetarian. A perfectly poached egg on top means this dish can be enjoyed from breakfast to dinner. Hummus and baba ganoush aren't the only two pureed Middle Eastern dips out there - caramelized carrots provide a sweet base for this dip, while Vanns Cumin, Coriander, and Harissa add earthy depth and spice. Rice bowls are starting to be a big thing these days, and there's a good reason. Take something a little saucy, something with some great texture, something with protein or some bite to it, arrange on top of rice, add the condiments of your choice, and enjoy your healthy, delicious, and filling meal! An autumnal hummus sweeted by butternut squash and spiced up by Vanns Harissa.